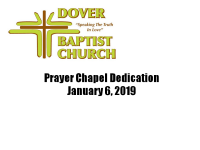 On Sunday, January 6, 2019 Dover Baptist Church dedicated it's recently renovated and reconfigured Prayer Room. This was kickoff for Prayer Week which runs from January 6th through the 13th. Each member is encouraged to spend an hour in prayer each week either in the Prayer Room or in your own home. The day started with a light breakfast served in the Family Life Center. Then attendees were encouraged to visit various prayer stations set up throughout the room. Prayer Commitment Cards were also distributed asking each person to sign up to be a prayer warrior and pray one hour per week. These photos were provided by Charlotte White. Gloria Early then opened the service talking about the Prayer Room and why we all need to spend time prayer each day. Bradley Gray was also recognized for his one year anniversary at Dover Baptist Church. Lily Drury's sister, Annie King gave her testimony and an account of her battle with cancer and how Dover Baptist Church helped her to overcome it. Bro. Early wrapped up services with a sermon on "My House Shall Be Called A House of Prayer" referenced in Matthew 21:12-13. To take a virtual tour of the Prayer Room, click the image below. Follow us on Facebook, just click the icon!